Exhibition Stands, Exhibition Stands UK, Exhibition Services | 200m2 | Cardboard Exhibition Stands: Are they any good? Cardboard Exhibition Stands: Are they any good? Last week, I wrote about the World Travel Market (WTM). Arguably the biggest travel trade conference in the world, WTM takes place every year at London’s ExCeL conference and exhibitions venue. Quite a few of the exhibitors at WTM this year had invested in ‘cardboard exhibition stands’. Some of these units looked quite impressive; large in scale with high quality graphics. Others looked flimsy and featured poor quality graphics – the overall impression in this latter case being somewhat ‘cheap’. It seems all cardboard stands are not equal! Some of the sturdier units looked very impressive – but they were let down with the choice of background colour – white! Within just two days of being on show they looked battered and marked. Most of the exhibition stands made of cardboard at WTM would have to be thrown away as a result. I think this is a great shame because the investment in print quality in some instances must have been very great indeed. Take the Andalucia stand for example. The Andalucia stand was the first WTM exhibitor to produce its stand entirely out of cardboard. That’s quite an achievement but what is the true environmental impact of taking such a move? Herein lies the problem – they did this because the UK market is conscious of sustainable and green tourism and not because it is at the root of their commercial outlook. Having an environmentally friendly stand shouldn’t be for just for ‘show’. The whole point of an environmentally friendly stand is that it should demonstrate a tangible reduction in environmental impact. Having seen the stand for myself, I wonder how much of the stand can be re-used. The knocks and dents won’t simply wash away with a damp sponge! Furthermore, I doubt it will survive transportation around the world without significant investment in ‘packaging’ – this only adds to the transport costs because the stand just takes up more volume. 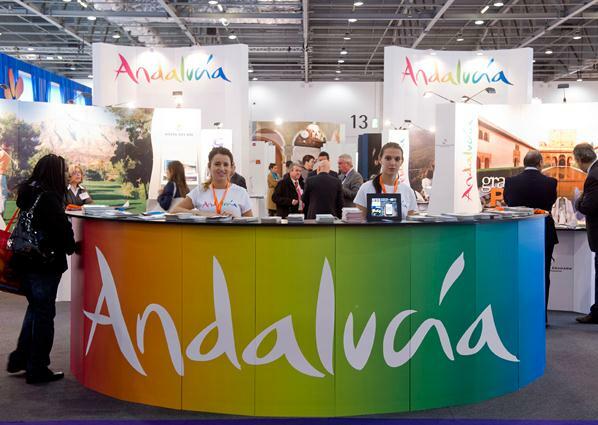 The Andalucia tourism board announced that the cardboard stand reduced its cost by around 60 per cent. At 75,000 Euros though, this is still a significant investment. If the stand can’t be used again though, these savings are irrelevant as any cost savings are negated. Consequently, the inks and cardboard required to produce the stand will simply be thrown into a landfill site. I would argue that high quality modular exibition stands, which can be re-used time and time again in different configurations, remain the most cost effective and environmentally friendly exhibition stand solution. If you can find a foldable solution which is compact and lightweight, transportation costs and the associated environmental impact are kept to an absolute minimum – TRUSSwire and CROSSwire are two such systems. Previous Previous post: Environmentally friendly exhibition stands? Next Next post: 200m2’s Team Survives 24 hours In A Liferaft!